Bindi has found her way upstairs to our ‘Evita balcony’ which overlooks our living room. 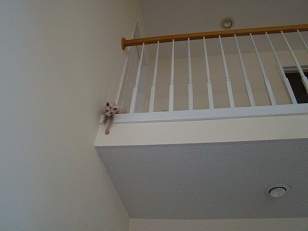 She gets up there and immediatly wants down. She cries and cries. I have to go to the stairs and call her so she can find her way back down. We play this game many times every day. When we got up this morning, we found Jenna (who is confined to her kennel when indoors) and Bindi running around the living room together. We’ve been anticipating Bindi busting her out one evening, and will very carefully monitor our long distance records this month.